This will be a photo post for the most part. 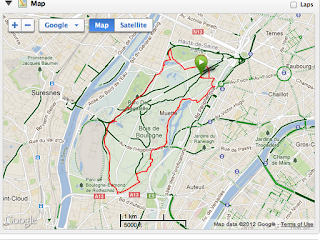 I just imported my Garmin workouts from the last few weeks and these two from Paris popped up, making me smile. One is a wacky loop around our neighborhood in Montmartre (I just used the force to find my way) and the other is on the trails of the large, serene Bois de Boulogne. Montmartre loop including the many hills around Sacre Coeur and even a large staircase. 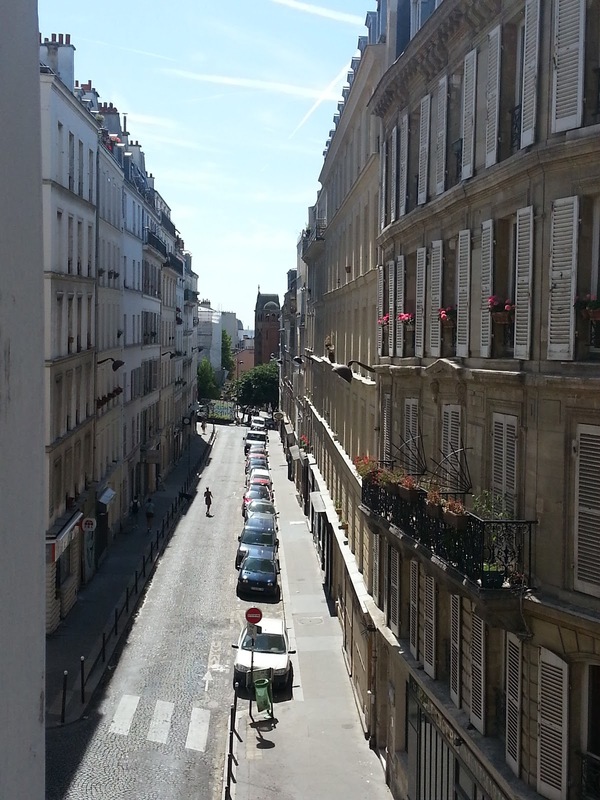 A shot, but hilly 4 miles. 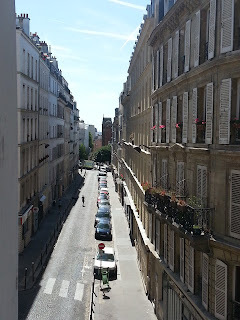 The cobblestone streets and narrow sidewalks kept things interesting. The park run that was supposed to be 4-5 miles but ended up as 7 because I just followed the trail markings and never saw the turnoff to do the shorter loop. Oh well, it was great. 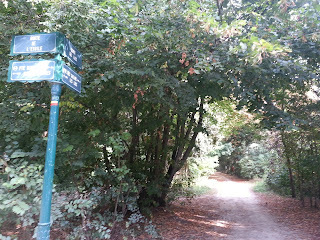 The quiet trails were sprinkled with runners and lots of dog walkers. Part of the reason I haven't been writing much is because I've been swimming so darned much this summer. I've been swimming super early most days of the week with the Master's team at my pool and racking up the yards. By the end of the day I'm ready to crash by 9:30 and get up to do it again the next day, so you can understand why I haven't found the time to blog. One of the main events that I trained so hard for finally took place this weekend after registering several months ago and months of prep- The Manhattan Island Marathon Swim Relay, aka MIMS relay. 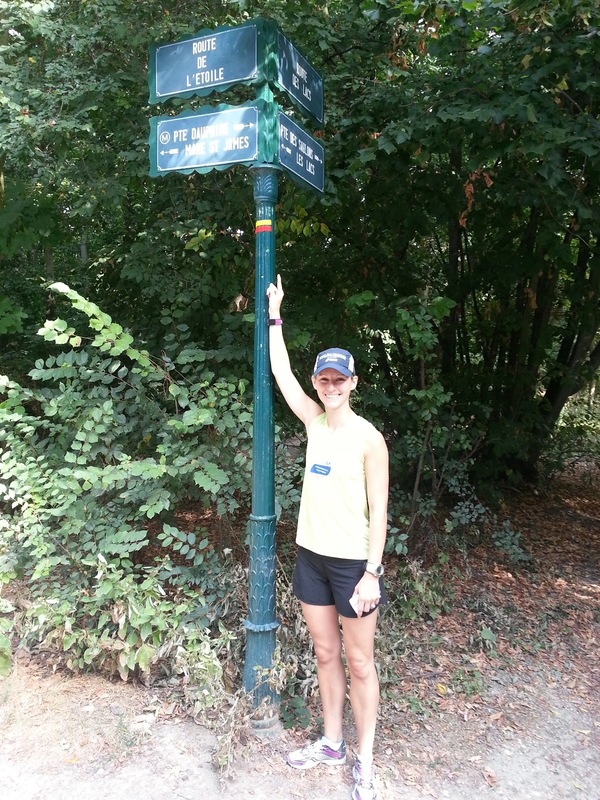 The planning for this day began back in October when I met a very ambitious and excellent young swimmer while volunteering for the Ederle Swim and Saturday was the result. 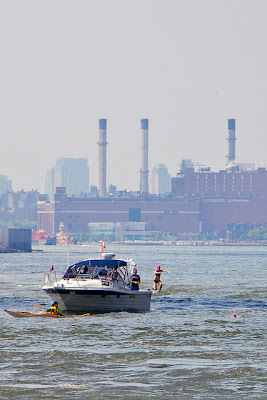 The plan was to dive into the water at South Cove in Lower Manhattan at 9am and swim east around the Battery, up the East and Harlem Rivers, across the top of Manhattan and back down, all while rotating swimmers onto the boat and into the water until we were done at South Cove again. I'm very happy to report that things went exactly as planned! My incredible team, Charlotte, Tom, myself and Bryant (we swam in that order) spent the day cheering, eating, resting and trying to stay cool and hydrated while swimming in 45 min and half hour shifts. We began at a little after 9am in Lower Manhattan with the new and grand Freedom Tower looming overhead. Our priceless kayaker, Kumiko, began her journey at the same time and offered us guidance and support for nearly all of the 28.5 miles and we can't even begin to thank her enough. 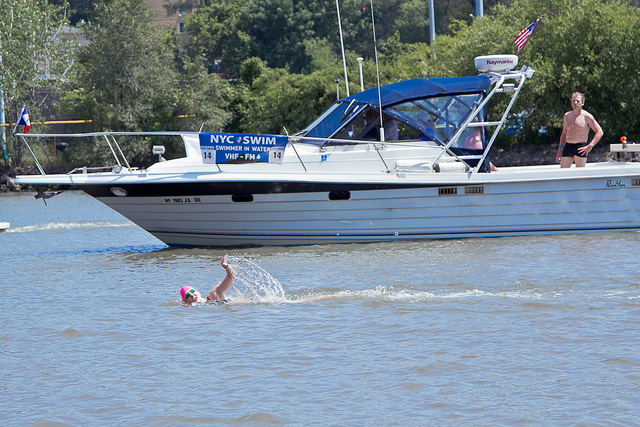 The race began in waves of about 5 or 6 swimmers and we watched from the boat as Charlotte began her swim against the current down to the southern tip of Manhattan where she quickly picked up pace as she entered the East River. The flood tide was pushing her upstream past the Brooklyn and Manhattan bridges, the view from the water is absolutely magical. Before we knew it she was at the Williamsburg Bridge and it was time to switch to Tom. Tom's first leg seemed to go by very quickly since I knew I was up next. He cruised past the Lower East Side and the United Nations and before I knew it we were closing in on the 59th Street/Queensboro bridge where I hopped in. 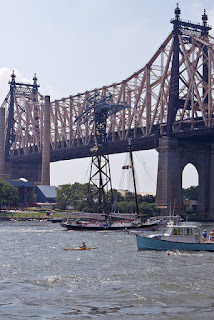 The Queensboro bridge has a special place in my heart as a major landmark of the NYC marathon and it reminds me of my friend TK, who claims it for her own. My first swim (of 4 that day) was so exciting and fun. I couldn't stop smiling and I really enjoyed being pushed along by the still flooding tide. 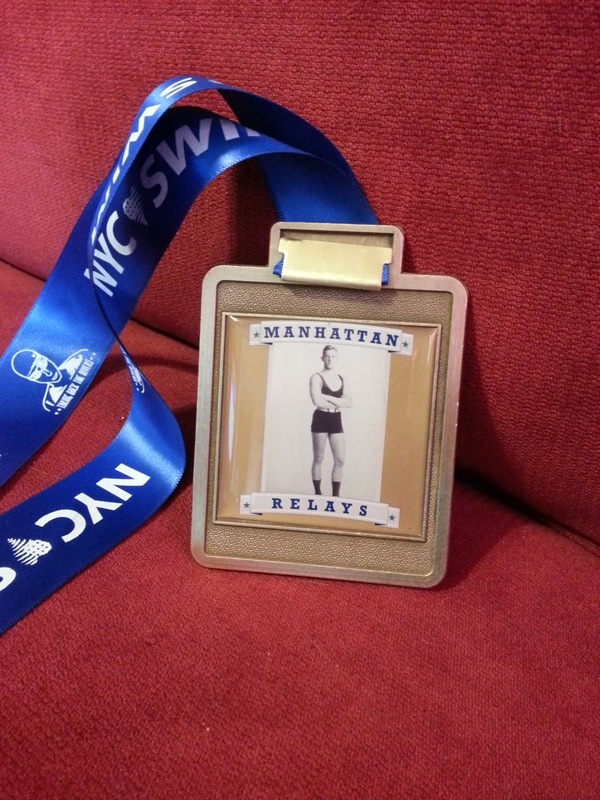 I swam from 59th Street up to the 102nd St Harlem footbridge that leads to Randall's island. It took me a few minutes to get used to following the cues from Kumiko to move left or right (she was trying to save me from crashing into Mill Rock) but once I did, it was a perfect swim. The water in the East River is very salty and it was pretty warm, but I was happy to be in the water instead of sweating like crazy on the boat. 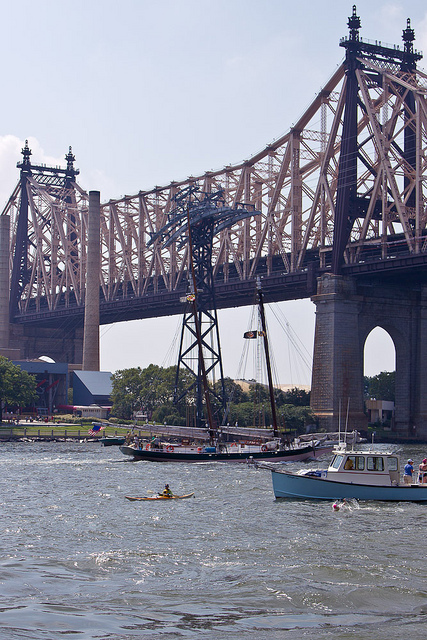 My first leg took me along Roosevelt Island, past the Upper East Side and towards the grit and spirit of East Harlem. I spotted Cornell Medical Center, Asphalt Green and Gracie Mansion (well, the park) along the way. As I swam towards the footbridge I was sad to be nearing the end of my first leg, it had only taken 38:36 instead of the allotted 45 mins, thanks to a strong current. Before I knew it, Bryant was swimming towards me for the exchange. I'll describe the exchange for those who aren't familiar with such goofy things. The current swimmer stops in the water while the new swimmer approaches from down stream and grabs the current swimmer's leg. The current swimmer raises her arm and calls out "ending" and then the new swimmer raises her arm and calls out "starting" before letting go of the leg and Swimming away. The finished swimmer then approaches the boat and climbs back on. First order of business upon re-entering the boat was always mouthwash. This sometimes made the water taste minty to the next swimmer. I was so excited about the swim and the bridges and the sights that I forgot to take time to eat between my first and second leg, and mistake I'd pay for a bit later, but I was focused on staying hydrated, cool and sunblocked and was successful. I wore a lightweight, long-sleeved white technical running shirt to block and reflect some sun, sunglasses and a lightweight white hat. I think it helped me stay cool and conserve energy during the day. I'm grateful to my friends John and Eileen for the advice to stay cool as much as possible. 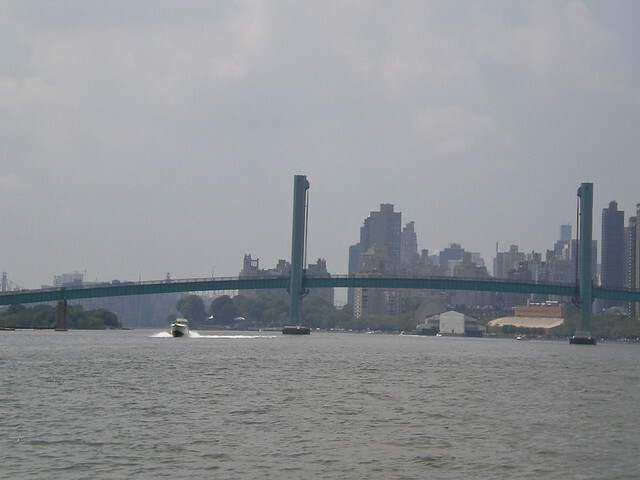 As Bryant and Charlotte made their way up the rest of the East River and into the Harlem, there was a noticeable calm. 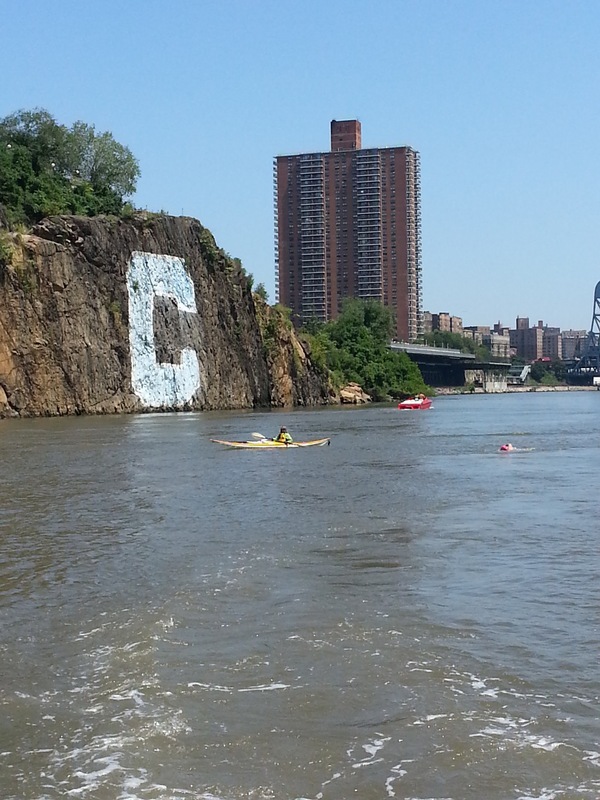 The Harlem River is narrow and shallow in comparison to the East and we settled into our rhythm and transitions. 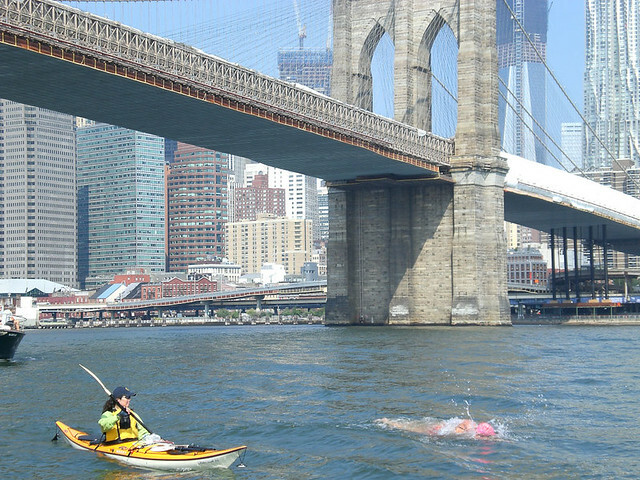 Before I knew it, Tom was back in the water and Kumiko forged ahead as we passed Yankee Stadium in hopes of taking a quick break and having a snack before meeting us again at 200th St. 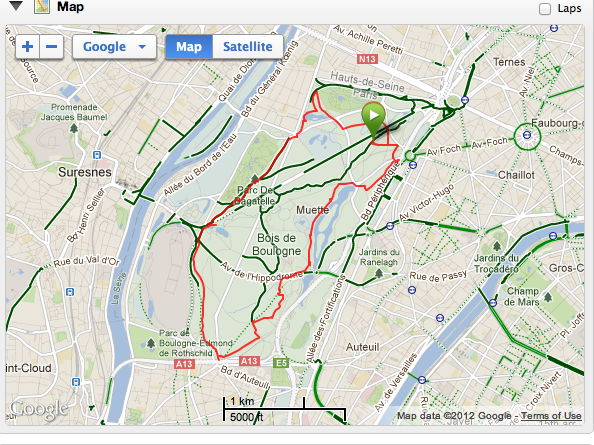 This meant that much of my second leg was sans kayaker. 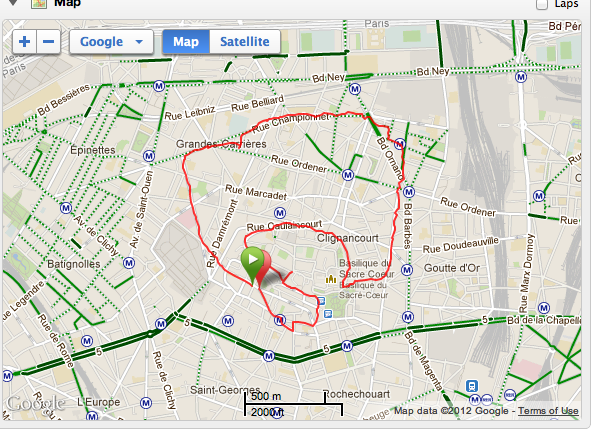 I used the boat to sight a little, but mostly I used landmarks around me because we were in MY hood! I hopped in at 181st still under the Cross Bronx Expressway bridge and swam north to about 220th,about 2 miles in 31:00. The Harlem River flows out with the Hudson, so we had the advantage of the current assist again. Weeee! 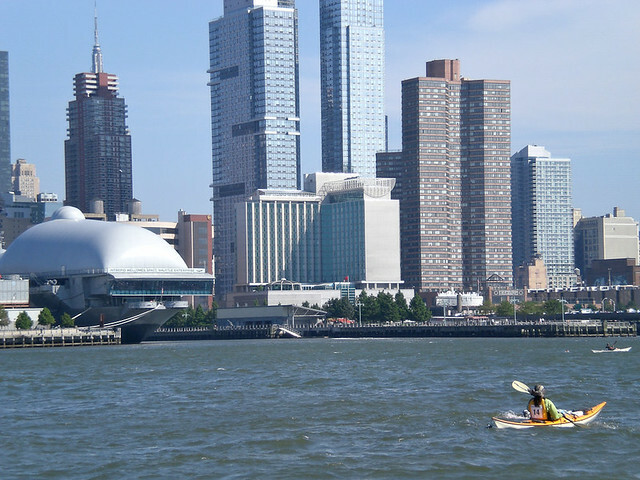 I had a blast on that second leg, swimming by Roberto Clemente State Park and Yeshiva University, both of which I see from my apartment every day. I saw Dave perched on the walkway around the Peter Jay Sharp boathouse and waved for a quick photo. It was just the boost I needed as my energy started to wane from lack of food. Oops. I swam strong to the end point, but was happy to get out and refuel. The rest of the Harlem River was really fun to watch from the boat because it really is my hood, we passed the parks and pathways that I've been running along for 7 years. It warms my heart right now just thinking about seeing Inwood Hill Park and the big C painted on the rock across the river all from a new point of view. Bryant makes his way across the top of Manhattan towards the Hudson. As we made the turn at Spyuten Duyvil and into the Mighty Hudson, the view nearly took my breath away. After spending the morning in the narrow channels of the East and Harlem, there Hudson sparkled in the sun in all its glory. 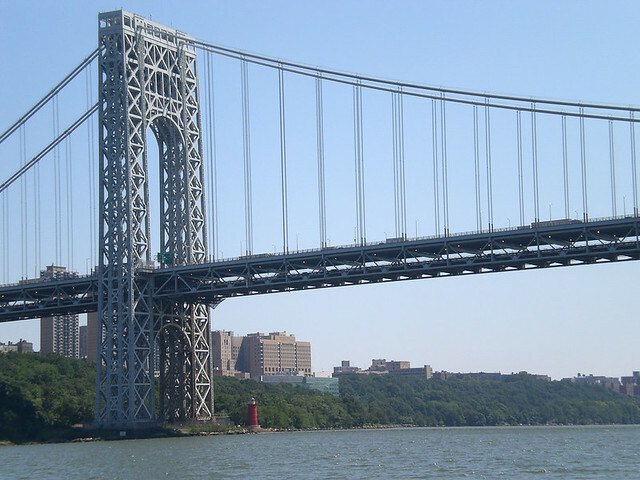 It is nearly a mile wide with the magnificent George Washington Bridge and its Little Red Lighthouse as gatekeepers. Charlotte did her best to reach the bridge before her time was up, but she came up just shy of the bridge and Tom was lucky enough to swim under. 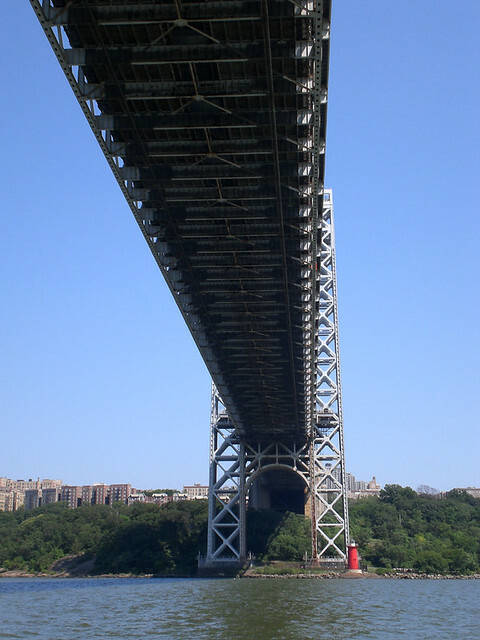 I was a bit jealous, but I was happy to get a few great shots from under my favorite bridge while Tom made his way down along Washington Heights towards Riverbank State Park. 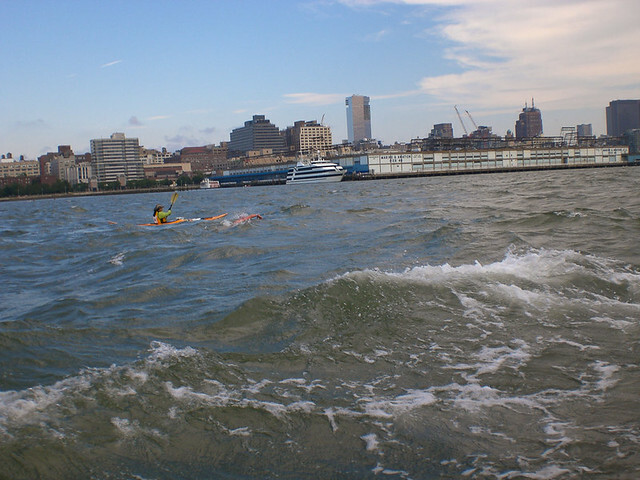 The water was getting a little choppy as we made our way down towards Harlem and we each noted the headwind that Kumiko was facing as she paddled along with our swimmers. We had 10 miles or so left to go and she was showing no signs of being tired or even that she was working that hard against the wind, but we knew she was. As I jumped in at 140th or so, Kumiko was a steady guide that I knew I could count on and that was becoming more important as the wind and chop picked up and sighting ahead became nearly impossible. The waves picked up and the Hudson River felt cool, fresh and wonderful. 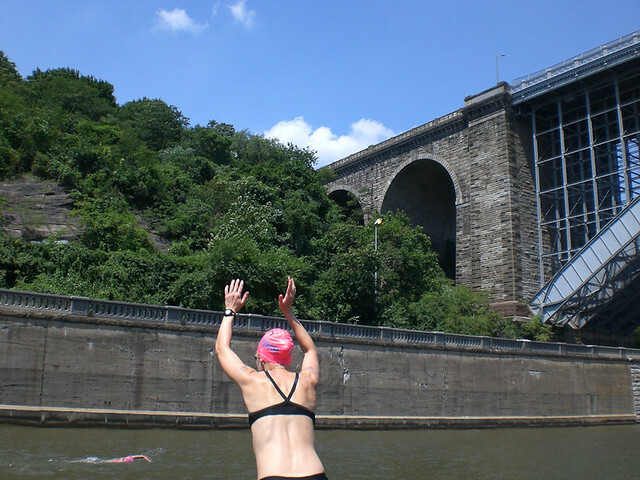 I remember trying not to smile too much as I swam past the beautiful Harlem Viaduct that runs over Fairway. I'd done a run along that route just the week before, it always reminds me of my time in grad school when I'd run with friends down to Central Park along the river. I kept the cathedral on 120th st in my sights, using it to try to gauge my progress, but at times it seemed like I wasn't moving at all! I was moving though, I pushed my way against the wind and chop to about 100th Street before my 30 mins was up and although I was tired, I was sad to get out of the water because there was a chance it was my last swim of the day. We were trying to judge how far we'd each make it and who might be the finisher, but it was impossible to know for sure with the changing weather. As Bryant made his way past barges and Charlotte swam past the space shuttle on the Intrepid, there was excitement in the air. The Freedom Tower was getting closer and we were really battling it out with the teams around us, trying to stay ahead of them while avoiding all of the traffic in the water. 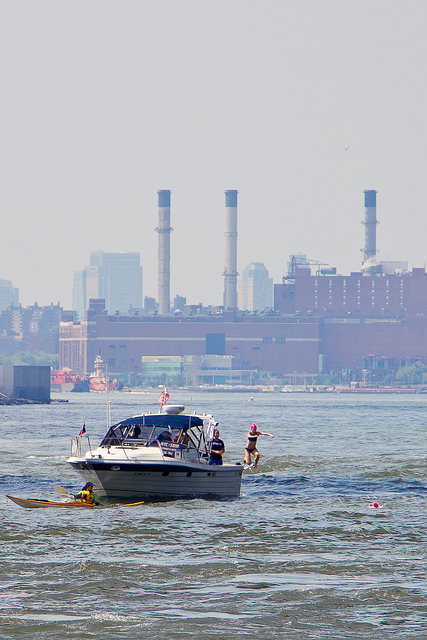 The Hudson river is one of the busiest waterways in the world and the traffic was constant. At one point the leaders all had to stop because a Norwegian Cruise Ship was backing out and wasn't waiting for anyone. There was a storm approaching from the south with ominous clouds and winds and we all exchanged a nervous glance, but the Captain assured us that it was far enough away that we'd have plenty of time to finish. When Tom hit the water for his last leg, we still weren't sure who was going to finish for the team, but it was going to be either him or me. Tom had 30 mins to swim from wherever he went in (I can't remember) to the top corner of Battery Park City and if he hit that point at 28 minutes, he would have to keep swimming because an exchange would be too dangerous between there and the finish. At that point in the day we were all pretty tired and the conditions were getting rougher, so we didn't want Tom to have to swim longer than necessary. Luckily for us, he reached Pier 25 right around 27 minutes and was able to float for a minute so we could make a safe and legal exchange before the final push to the finish. I was really excited to be finishing for the team and in my head I only had to swim 1/4 of a mile or so, so I took off swimming like crazy and kept going (turns out it is actually about 0.8 miles). I didn't have the luxury of sighting off of Kumiko's kayak because she turned off at Pier 40 after a VERY long day, so I was on my own. The waves were huge and the boats had to stay far offshore so they didn't run us over, so I used the sea wall and the cheering crowd to guide me home. I swam for only about 11 minutes, but it was SO MUCH FUN. There were lots of people in BPC cheering along the sea wall, many of them completely dumbfounded at the people swimming in the river, and I was full of adrenaline. As I turned the final corner into south cove I saw another pink cap right next to me! "Where did she come from?!?! "I thought. I put my head down and sprinted into the finish, stepping out ahead of the finisher for Team Renegade. We smiled and congratulated each other and Morty called it a tie. 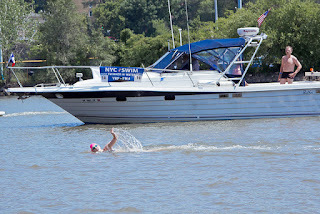 If you look at the results on NYCSwim.org you will see that we're listed as "10th place" even though I definitely came out of the water before her. ;) We tied for 9th place overall with a time of 8:15:43. Unbelievable! 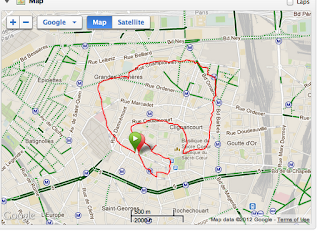 We were a mere 17 minutes or so behind the winners and we're already plotting our adventure for next year. The evening finished with a glorious shower at Tom's apartment in TriBeCa and swimmer's dinner and awards at Merchant's restaurant in Battery Park City. I'm pretty sure it was fun, but all I remember is having an irritated eye and wanting to nap on my plate of penne. We hopped in the car and rode home and I was asleep before Dave got back from parking the car. I'd have loved to stay out and celebrate (after a nap), but my good friend was getting married the next day and I was a bridesmaid! What a great weekend... I can't wait to do it again. I swam 4 times for a total of 7.05 miles or so, the most swimming I've done in a day in my entire life! WHEW.